Cheese cake is almost everyone’s favourite dessert! I had my non-baked cheese cake recipe earlier on.. And learnt this baked one from a baking class recently. The thing I liked particularly about this recipe is the almost melt-in-mouth softness. With yogurt added into the recipe, it’s not just about adding fragrance and taste, it makes the cake more mellow. 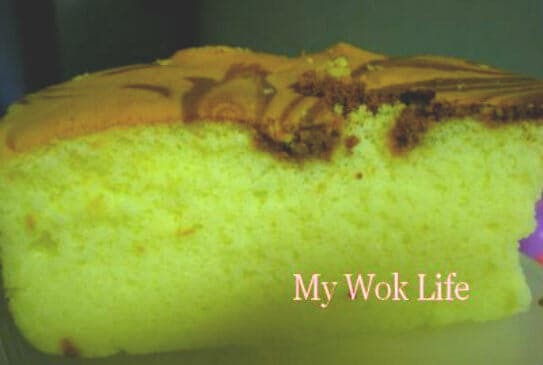 Unlike creamy cheese cake, this cottony soft and moist cake was not too sweet. I have sweet-tooth, but I don’t like my dessert to have too much sugar. And, this recipe has the perfect sweetness for me. Thanks to the right amount of sugar added and also the contribution of yogurt taste to it! Seriously, you may not know, if you don’t try this… fragrant, soft, smooth & moist cheese cake, fresh from your oven.. For goodness sake, serve this heart warming cheese cake to your friends and family during occassions and holidays, they won’t stop talking about you, and will come back for more.. The problem is, you have to do this everytime… (chuckling). Marbled it or having just the plain yogurt cheese cake, they both are absolutely good to taste! Yup yup, I used low-fat yogurt and milk to trim down the extra calories here! Yeah! 1 large deep pan, at least 12″ in diameter with 1″ in height, for steam-baking. 1) Preheat oven to 150°C for 15 – 20 minutes. Beat soft cream cheese with electrical mixer/ beater till coarsely blended. Remove from mixing bowl, and place in a large cooking pot. Add in plain yogurt, soft butter, sugar (50 grams) and milk. Boil cream cheese mixture until all ingredients melted, and leave to cool. 2) Add egg yolks to cooled cream cheese mixture and mix well with a hand whisk. Combine and sift plain flour and corn flour, before adding into the cream cheese mixture. 3) Whisk pure egg whites, sugar (100 grams) and cream of tartar in a clean and oil free mixing bowl, with electrical mixture/ beater at maximum speed, until stiff peak (light and foamy texture). To test its readiness, turn over the mixing bowl, the meringue should adhered to the upturned bowl. 4) Combine cream cheese mixture with meringue and fold well, preferably by clean bare hand (or spatula), in repeated upward circular motion until batter looks glossy. 5) Grease the sides and line the bottom of baking tin with baking sheet/ non-grease paper. Pour almost all the batter into greased baking tin. Leave just a little batter (about a bowl) to create marble design. 6) To create chocolate marble design: Add 1 tablespoon of chocolate essence/ cocoa powder into the remaining batter, and combine well. Scoop and top dark batter onto light batter in the baking tin. 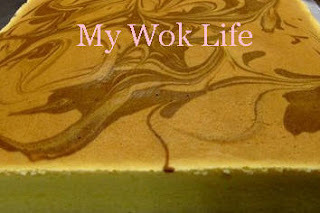 Place dark batter right at the centre, and scatter it with a stick or chopstick for the marbling. 7) Place baking tin over a larger deep pan filled with 1cm of hot water to perform steam baking, for about an hour on the lowest rack of oven, or until a metal skewer or toothpick inserted in the centre comes out clean. 8) Remove baking tin from oven, and cool for 10 minutes before removing the cake from the tin. Cut and serve warm or store in refrigerator to serve chilled. A thick slice of steam-baked marble yogurt cheesecake counts about 250kcal. Hey! I’ve had it skinnier with low-fat yogurt and low fat milk. Tips: Place baking tray on the lowest rack to avoid cracks on top of the cake when baked. * To beat the egg whites successfully, eggs must be fresh, and the whites must be free from any yolk. Beat egg white in clean and oil-free mixing bowl. * Cream of tartar: Comes in powdery form, and easily available at most supermarkets and baking supplies stores. In any case if you do not have it, substitute with corn flour. * Chocolate marble can be replaced with coffee flavour, if desired. Use the normal baking tin will do.. This is a steam-baked cake, so it’s rather firm to be over-turned and removed from the cake tin without damaging the shape of it, just like any other cake e.g. butter cake, chocolate cake.. Only creamy cheese cake will be more advisable to use tin with removable base. Thanks soo much for this recipe Patricia. I baked this for people at work recently and it turned out amazing! I followed the recipe to the T, but it didn’t turn out well for me. It was crumbly and not easy to slice and just a tad sweet for us. Not sure what went wrong ..
Would it be not enough cream of tartar? Or too much milk or yogurt? Did you beat the egg white enough till foamy? There are many possibilities and I can’t point out to you what exactly went wrong without details, but my recipe wouldn’t go wrong..
Perhaps you need try a few more times? Increase cream of tartar or reduce liquid, and lessen sugar amount, if find too sweet..? this is my first time leaving a comment though i have been reading your work. Am very interested to bake this Marble Yoghurt Cheese Cake. Just 1 question, for the oven heat, is it “oven without fan” or “oven with fan”? I noticed that some website will lower the temp by 20 degree if the oven is turned on with fan. Oven with fan is the convention oven which it has fan to help circulating heated air to cook food faster, and hence, it uses lower temperature to cook the same food as regular oven.